It wasn’t your typical class. 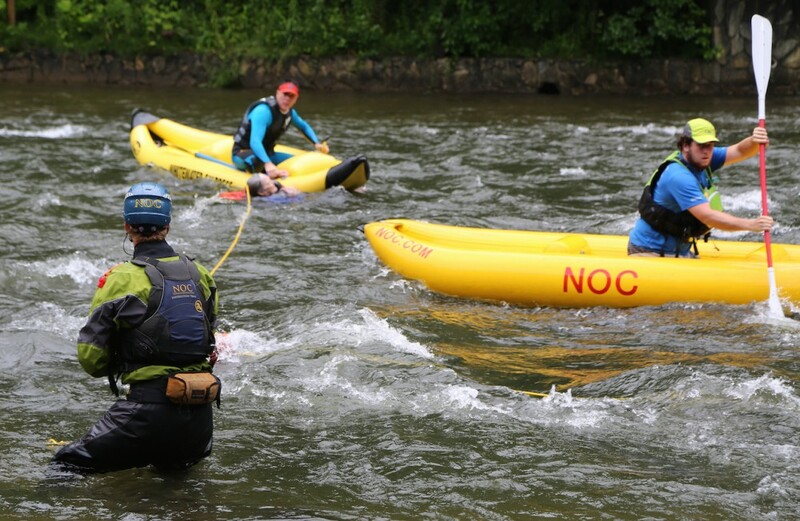 The group of 11 men and women wore helmets, life jackets and rain gear and stood ankle deep in the swirling river current as the instructor led a swift water rescue class at Nantahala Outdoor Center near Bryson City, North Carolina. 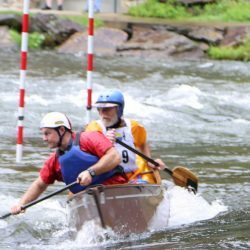 The river is popular with rafters of all ages. 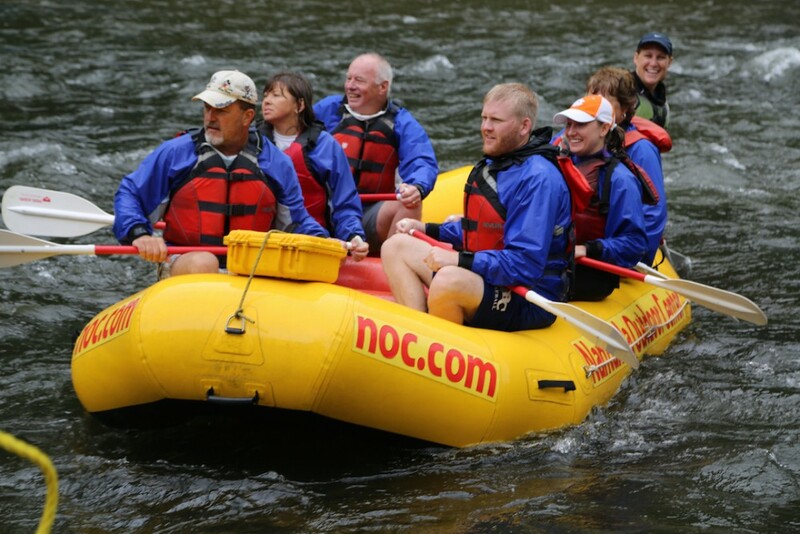 It wasn’t long before their first ad hoc demonstration came floating down the river. A woman was being swept down the river, hands crossed over her chest, a panicked look on her face. “Help me,” she cried faintly, holding her head just out of the water. 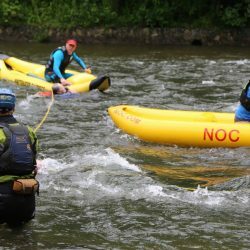 The instructors and other NOC staff sprang into action, quickly paddling rafts in her direction while another threw a long yellow rope her way and calmly instructed her to grab it. In shock, she didn’t move and a staff member had to grab her and lift her into the boat. They paddled the badly shaken woman safely to shore. 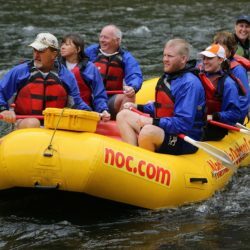 The swift water class is just one at NOC, where the SOLO Wilderness Medicine center has courses and certifications for EMTs, Wilderness First Responders and Wilderness First Aid. Pat told us that NOC would be hosting firefighters from New York City and were seeking a permit to sink a car to train them in underwater rescue. That was just one of the many fascinating things I learned about the NOC during a recent visit there. The NOC has 1,000 employees working on seven rivers. The Nantahala location alone has lodging for 211 people, including five rustic cabins, and hosts several summer camps for children in conjunction with the North Carolina Camp Association. 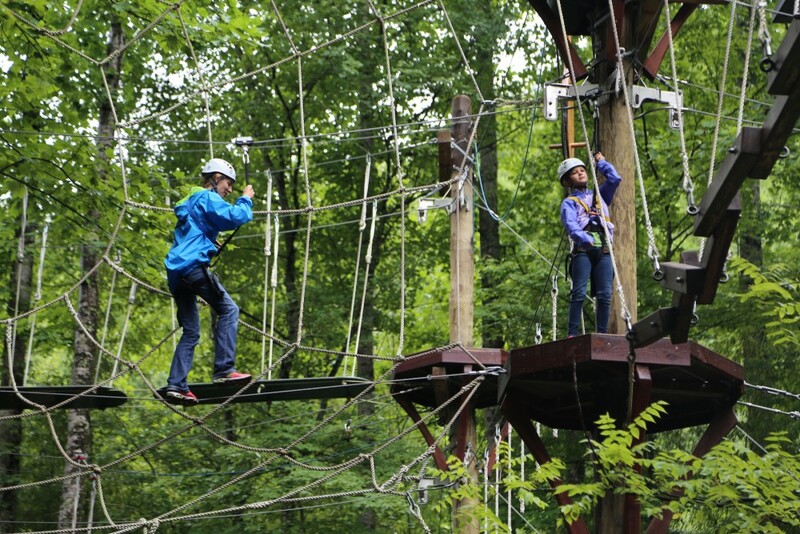 An Amputee Adventure Camp is offered for wounded warriors. 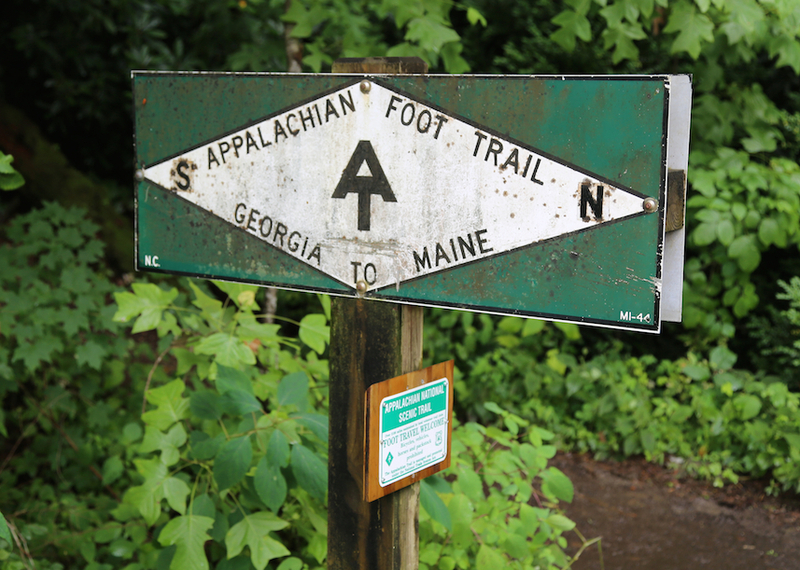 Located right on the Appalachian Trail, a two-week hike from its start, hikers can pay $19.38 for a bunk with mattress, shower and towel at the hostel-style base camp. “We have an excellent outfitter store, with experts to help hikers find the right equipment, approved by our Master Guides. 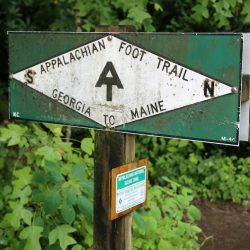 Often, they toss out the gear they bought at Walmart and provide them with what they really need for camping,” Pat told us. 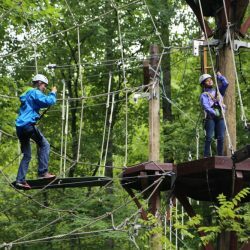 Day visitors can enjoy five zip line adventures, mountain biking, kayaking, paddleboarding, fishing tours, guided hikes, paintball, a ropes course and train excursions on the Great Smoky Mountains Railroad. 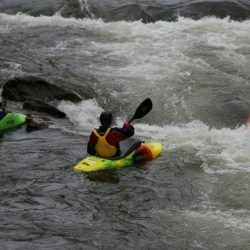 Around 1,100 rafters float on the class 1 and class 2 rapids each weekend. A call center is staffed with 30 people to handle up to 4,000 calls a week for information on activities. We had started our day with a delicious meal of fish tacos at River’s End Restaurant, one of three on the property. Seated just a few feet from the river, turned a dark green from the steady rainfall of the drizzly day, we had an excellent view and sat enthralled as raingear-clad participants launched their boats of various types one by one into the current for the Canoe Cup Challenge taking place that day. 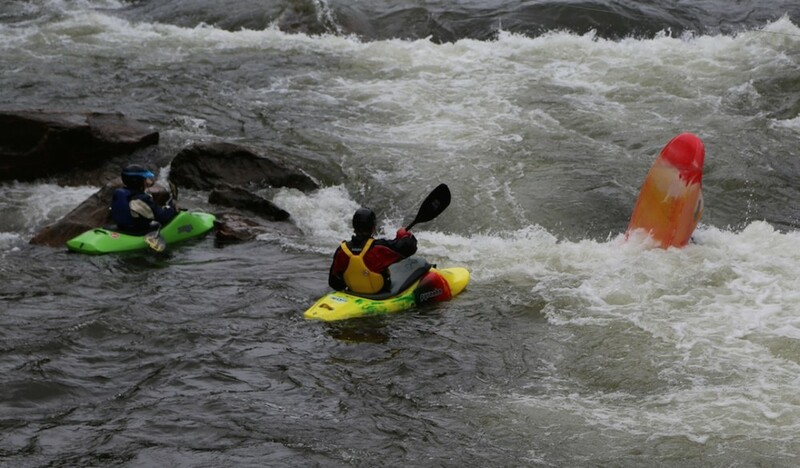 A trio of kayakers practice their rollovers in a water feature. 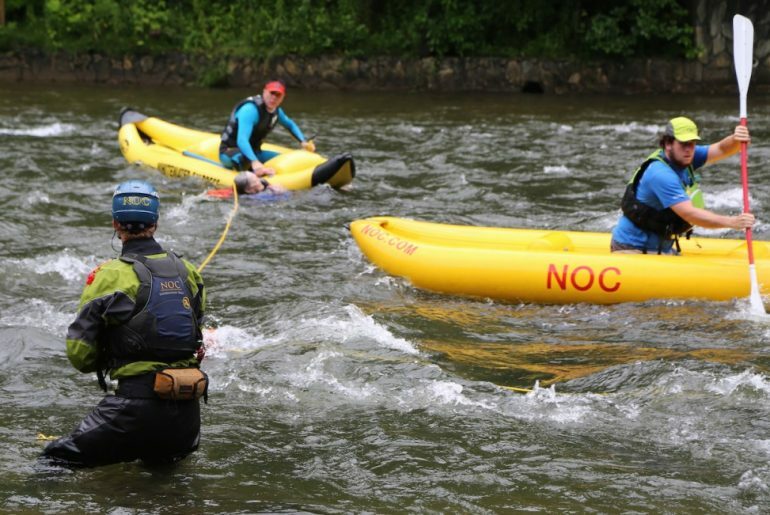 The NOC has the largest paddling school in the country. After lunch we walked over the bridge spanning the river for a closer view as boaters navigated the red and green gates in the class 2 rapids. 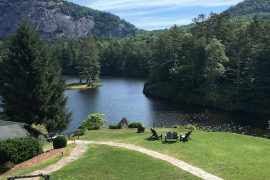 With no let-up in the rain, our paddleboard adventure was cancelled but we had a great day as Pat drove us around the huge 500-acre property. On our return to the main part of the campus, we watched as three kayakers took turns practicing their rollovers in one of the water features created for training. 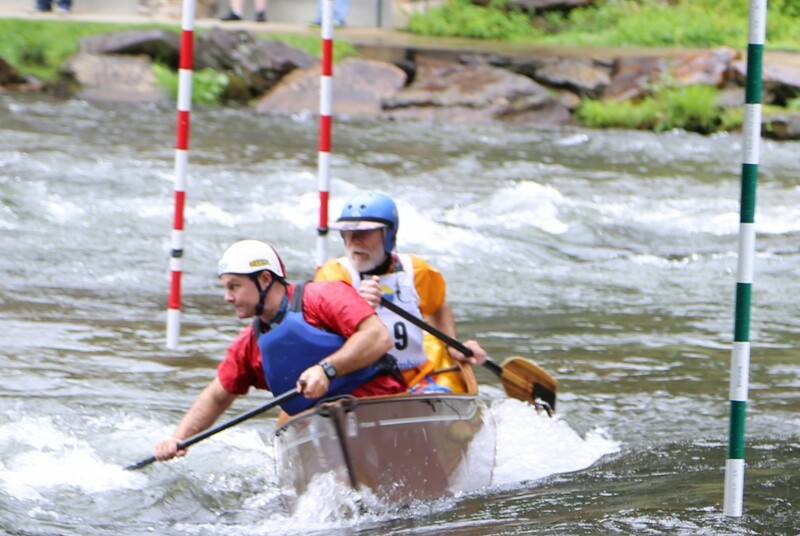 The NOC has the largest paddling school in the country and 22 members of the Olympic Kayak Team have trained there. After a look in the well-stocked Outfitters Store, acclaimed as one of the best in the world, we visited the convenience store, where Pat treated us to another of the NOC’s gems — a Nye’s Cream Sandwich, available in flavors like blueberry pie, peach and strawberry shortcake. 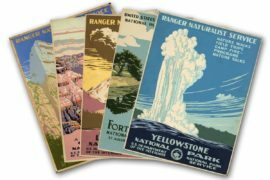 On our return trip, we plan to stay in one of those cabins, get that paddleboarding session in and maybe even a raft trip. 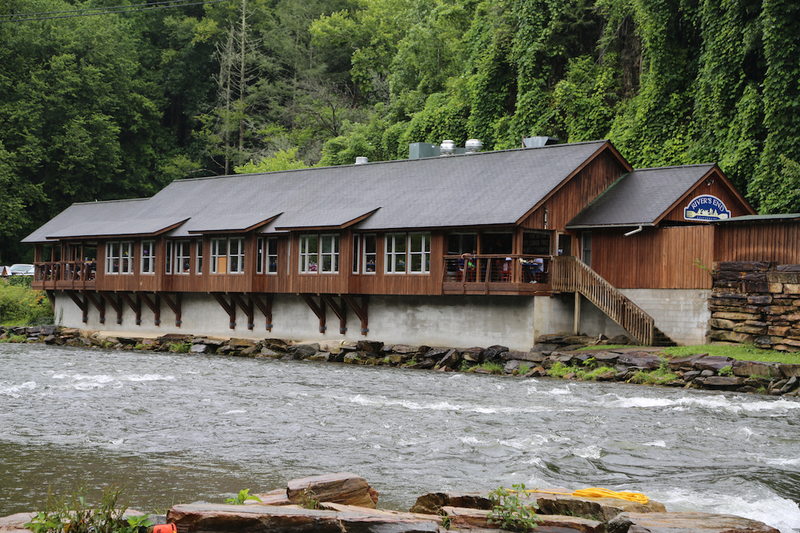 And of course, we’ll enjoy a meal at River’s End, followed by one of those delicious ice cream sandwiches.